The Zerotracer, on display at Abu Dhabi Sustainability Week, is battery powered and runs 250 kilometres on one two-hour charge. Credit: Narash Newar. 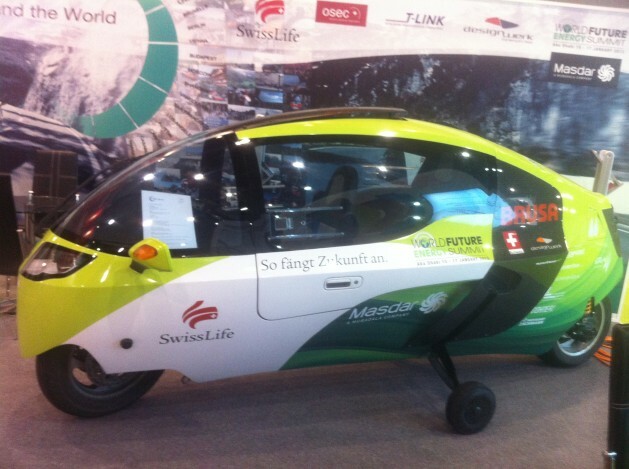 ABU DHABI, Jan 17 2013 (IPS), Jan 17 2013 (IPS) - The 200-kilograms two-seater Zerotracer completely stole the show at Abu Dhabi Sustainability Week. Yours for about 150,000 euros, the vehicle works both as a car and a motorcycle, depending on the mood of the driver, by manually removing or adding two wheels. But that is not the real reason it’s a unique show-stopper. The fact that it’s electric with a closed cabin makes it “many times more efficient than a conventional motorcycle,” says Viviane Mor, international affairs project manager for T-Link, a trade fair marketing company showcasing the Zerotracer in Abu Dhabi. Its electrically rechargeable Lithium-Manganese batteries (21kWh, 400V) weigh in at 160 kg and can be charged quickly to be road-ready in 30 minutes – a full charge takes about two hours. Regarded as the most efficient high-performance vehicle in the world, it needs the equivalent of only 0.7 litres of gasoline to tun 100 kilometres. The battery, which can be charged up to 2,000 times, can run up to 250 kilometres on a full charge and 500,000 kilometres over its full life span. So, If taken out for 20,000 kilometres-worth of trips each year, the Zerotracer’s batteries would last for 25 years, according Tobias Wülser of Designwerk, the three-man Swiss team behind the Zerotracer. “This idea came out of my thesis at the Academy of Art and Design in Aarau, where I studied Industrial Design,” says Wülser, who is the company’s chief designer. As the only motorcycle with constant torque from 4,000 to 11,000 revolutions per minute (rpm) — loosely speaking the force with which the motor rotates — the Zerotracer touts faster acceleration and higher speed without the use of gear shifts. Together, the vehicle’s unique assets propelled it to win the 2011 Zero Emission Race – with a Guinness record nod — that sent contestants traveling the world in 80 days. The race included a trek through the Gobi desert, where there was no electricity to recharge. Should this vehicle be equipped with Solar Panels? But…. if it was, Hollywood wouldn’t allow it to be shown! Will newer fly, due to expensive propitiatory parts. No one wants this type of silent vehicle, zooming around pedestrians. that ‘problem’ is so easy to solve, amigo, it’s not worth mentioning… so don’t.